This is a voyage for experienced ski mountaineers who climb snow covered alpine mountains and ski downhill. A typical ski day will involve climbs of 900 to 1200 m (on occasion as much as 1900 m). Non-skiers explore the valleys and lower peaks on snowshoes. Day 1 - If you arrive from Copenhagen or Keflavik at the Nuuk airport on the scheduled flights (flight not included in the voyage cost) you will be transferred to the ship. Embarkation starts at 16.00 hrs local time. Passengers who have arrived earlier will have time to do some independent and self-guided local outdoor sightseeing until the embarkation process starts ( please bring warm and waterproof clothes). Nuuk (Godthåb), the capital of Greenland has a population of about 16,000 people. The museum has a collection of Inuit mummies, from the 15th Century, which were found near Uummannaq. The Cultural Centre of Greenland - Katuak has exhibitions of Greenlandic artists, is also worth visiting. There are historical buildings from colonial times and bookstores with books about Greenland. 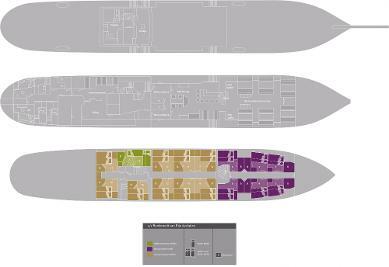 The ship will depart in the early evening into the interior fjords of Nuuk. Day 2 – We spend the day in the fjord system East of Nuuk for a ski mountaineering excursion whilst the non-skiers can enjoy a walk with snowshoes. The ski mountaineers may climb up to Mount Sadlen (1210 m and the snow walkers will enjoy a walk on the lower slopes. In the evening, on our way north, the crew may rig the sails on all three masts (wind and weather conditions allowing) sailing overnight. Day 3 – We arrive in the Maniitsoq area. The town of Maniitsoq is nestled on an island at the mouth of a fjord surrounded by peaks above 2000 m. The port of Maniitsoq is ice free from late spring to early winter. Here we will find a ski and snowshoe tour for the afternoon. The rugged mountains tower from the sea and the views from this height are great. Later we sail North to Eternity Fjord. Day 4 – The skiers climb a 1000m peak at the interior of Taaterat Glacier. The snowshoe walkers will in the meantime explore the rugged glacier fronts which come all the way down to sea level. The snowshoe walkers choose one of the many hikes in the area, for instance near the Sermitsiaq glacier. Day 5 – The Northern slopes of the mountains surrounding the Kangerdluarssuat fjord north of Kangaamiut will offer promising ski outings. The snowshoe walkers opt for an easy route whilst the ski mountaineers scale higher peaks and pick a downhill run. Back on the ship everyone will enjoy a great scenic evening cruise. Day 6- The slopes of the mountains surrounding Kangerluarsuat are attractive for skiers and snowshoe walkers. The snow conditions govern our best options for the day. We will spend the night North of Hamborgarland. Day 7 – Hamborgerland offers rugged scenery and the mountain tops are flanked by impressive glaciers. North facing slopes become our playground for alpine descents. In the evening we will depart towards Maniitsoq and enjoy the evening hours at sea. Day 8 - We disembark in Maniitsoq. We board the charter plane from Maniitsoq to Kangerlussuaq , and onward scheduled flight to Copenhagen (flights not included in the voyage cost). These are voyages for experienced ski mountaineers who climb snow covered alpine mountains and ski downhill. A typical ski day will involve climbs of 900 to 1200 m (on occasion as much as 1900 m). Non-skiers explore the valleys and lower peaks on snowshoes. Day 1- We arrive in Maniitsoq from Kangerlussuaq by chartered plane (flight not included in the voyage cost). Embarkation starts at 16.00 hrs local time. Passengers who have arrived earlier will have time to do some independent and self-guided local outdoor sightseeing until the embarkation process starts (please bring warm and waterproof clothes). The town is nestled on an island at the mouth of a fjord surrounded by peaks above 2000 m. The port of Maniitsoq is ice free from late spring to early winter. It is a community where fishing and hunting form the backbone of the economy. There is a museum which portrays regional history and culture. The ship will depart in the early evening. Day 2 - East of Hamborgerland we reach the fantastic landscapes of the Sermilinguaq Fjord. The Maniitsoq area offers the most rugged scenery and mountain tops are flanked by impressive glaciers. The snowshoe hikers will explore the lower slopes and viewpoints. We continue sailing North. Days 3-5 - We spend quality time in the Evighedsfjorden (Eternity Fjord) and Kangerdluarssuat fjord. The skiers climb a 1000 m peak at the interior of Taaterat Glacier. The glacier itself comes all the way down to sea level. The snowshoe walkers choose one of the many hikes in the area, for instance near the Sermitsiaq glacier. The other days we aim for other high alpine peaks in the region. The view across Eternity Fjord from the top of the mountains is magnificent. The Northern slopes of the mountains surrounding the Kangerdluarssuat fjord north of Kangaamiut will offer promising ski outings. The snowshoe walkers opt for an easy route whilst the ski mountaineers scale higher peaks and pick a downhill run. Once skiers and snowshoe walkers reassemble back on the ship we will sail through this beautiful alpine scenery and enjoy the evening in a relaxed atmosphere onboard. Day 6– The slopes of the mountains surrounding Kangerluarsuat are attractive for skiers and snowshoe walkers. The snow conditions govern our best options for the day. We will spend the night North of Hamborgarland. Day 7– At the North side of Sermersuut (Hamborgerland) we ski for the last time into the glaciated interior of this beautiful and unique wilderness. North facing slopes become our playground for alpine descents. Snowshoe walkers will enjoy a coastal walk to a viewpoint. In the evening we will depart towards Maniitsoq and enjoy the evening hours at sea. Day 8– We disembark in Maniitsoq. We board the charter plane from Maniitsoq to Kangerlussuaq, and onward scheduled flight to Copenhagen (flights not included in the voyage cost). Day 1-We arrive in Maniitsoq from Kangerlussuaq by chartered plane. The town is nestled on an island at the mouth of a fjord surrounded by peaks above 2000 m. The port of Maniitsoq is ice free from late spring to early winter. It is a community where fishing and hunting form the backbone of the economy. There is a museum which portrays regional history and culture. Sperm Whale frequently surface in the waters near town. Day 2 - East of Hamborgerland we reach the fantastic landscapes of the Sermilinguaq Fjord. The Maniitsoq area has rugged scenery with mountain tops flanked by glaciers reaching down to the sea. On snowshoes we will explore the lower slopes and viewpoints. Day 3 - At the mouth of Evighedsfjord (Eternity Fjord) weoftensee Humpback Whales. We sail into that fjord and sail along the nearby glacier front. Further into the fjord we sail among the highest alpine mountains in West Greenland. Day 4 - We arrive at Sydbay (Ukivik), where the 18th Century whalers traded with the Greenlanders at the annual Assivik, a time when people from a large area come together on a beautiful sandy beach. We land also at nearby Isortoq where remains of houses from the Thule culture can be found. In this area we may also see reindeer. Day 5 – Today we are in the mouth of the Disko Bay, surrounded by rich waters, which attract both seabirds and whales. We expect to see our fist Greenland Whales. In the evening we spend the night in Fortune Bay, where there are warm springs. Day 6 - Another day of opportunities to see Greenland Whale, when we sail south of Godhavn. In the afternoon we sail to the mouth of the Jakobshavn Isfjord with its enormous icebergs, where we will float for a few hours. Day 7 – A third day of opportunities to see Greenland Whales when we sail from Jakobshavn Glacier to the nature reserve Grønne Ejland, where we see the remains of a small 19th century Greenlandic settlement and a small cemetery. Day 8 -We arrive in Aasiaat, a settlement which was created in the 17th century to support the whaling at the mouth of Disko Bay. Its port is ice free from late spring to early winter. In the morning we fly from Aasiaat to Kangerlussuaq by chartered flight, and onward by scheduled flight to Copenhagen. Day 1 - We arrive in Aasiaat from Kangerlussuaq by chartered plane.Aasiaat is a settlement which was created in the 17th century to support the whaling at the mouth of Disko Bay. Its port is ice free from late spring to early winter. Day 2 – Today we are at the mouth of the Disko Bay surrounded by rich waters which attract both seabirds and whales. We expect to see our first Greenland Whale. In the evening we spend the night in Fortune Bay, where there are warm springs. Day 3 - Another day of opportunities to see Greenland Whales, when we sail south of Godhavn. In the afternoon we sail to the mouth of the Jakobshavn Isfjord with its enormous icebergs, where we will float for a few hours. Day 4 – In the morning we land at Flakkerhuk, on the east side of Disko Island, making our way through waters dominated by huge icebergs. We intend to land at several points along the coast, like Narujuk and Modderbugt to observe a population of birds typical to the High Arctic, with species such as Long-tailed Skua, Turnstone and Grey Phalarope. The birds breed on a beautiful tundra landscape backed by basalt cliffs. Later in the day we may also pay a visit to Saqqaq, famous because of the remains of dwellings of the Saqqaq Culture, 4000 years ago. Some miles to the west are cliffs with Cormorants and a beautiful hidden lagoon with remains of turf houses. An alternative is to sail into Ata Sund to the glacier front of Eqip Sermia. Day 5 – In the morning in Davis Strait we may catch a glimpse of the edge of the Baffin Bay sea-ice, some tens of miles west of Disko Island. We will try some landings in Nordfjord and Qasigissat, in a lush tundra landscape near lakes in valleys surrounded by basalt cliffs. At Qasigissat there are accessible populations of ducks and geese. Day 6 – In Diskofjord we sail into the Kuanerssuit Fjord toward some warm springs. Near Sioraq settlement, where the people keep sledge dogs, we also visit a Thule dwelling site with large turf huts in a great setting. In the evening we cruise along Queqertaq Island (1000 m high) with the largest Northern Fulmar colony in Greenland. Day 8 - We arrive in Aasiaat. In the morning we fly from Aasiaat to Kangerlussuaq by chartered flight, and onward by scheduled flight to Copenhagen (flights not included in the voyage cost). If there is still too much sea ice west of Disko Island (possibly in May and early June), we will remain in Disko Bay and explore to the southeast of Disko Bay and land on the central island of Grønne Island. By mid June the Bowhead Whales have left Disko Bay and in summer and autumn we will not see them anymore in this area. Day 2 - Today we find ourselves just south of the large Jakobshavn Glacier with its enormous icebergs. The Jakobshavn Isfjord is a World Heritage Site. Just south of it we may climb a hill and enjoy the view across the bay with icebergs. Day 3 – In the morning we land at Flakkerhuk, on the east side of Disko Island, making our way through waters dominated by huge icebergs. We intend to land at several points along the coast, like Narujuk and Modderbugt to observe a population of birds typical to the High Arctic, with species such as Long-tailed Skua, Turnstone and Grey Phalarope. The birds breed on a beautiful tundra landscape backed by basalt cliffs. Day 4 - We arrive at Sydbay (Ukivik) on a beautiful sandy beach, where the 18th Century whalers traded with the Greenlanders during the annual Assivik, an occasion when people from a large area come together. We land also at nearby Isortoq with remains of houses of the Thule culture. In this area we may see reindeer. Day 5 - Kangaamiut at the mouth of Evighedsfjord (Eternities fjord) is a friendly Greenlandic village where people still indulge in handicraft. Some way into Evighedsfjord near the glacier fronts of Sermetsiaq and Taterat Sermiat we are surrounded by mountains of nearly 2000 m high. In the mouth of this fjord system we often see Humpback Whales. Day 6 - East of Hamborgerland we reach the fantastic landscapes of the Sermilinguaq Fjord. The Maniitsoq area has rugged scenery with mountain tops flanked by glaciers reaching down to the sea. Day 7 - South of Maniitsoq between Alanngua and Atamik, we land in an area which is the base of a large impact crater, caused by a huge meteorite, which hit the earth about 3 milliard years ago. It is the oldest impact structure recorded to date on earth. Day 8 – On the island of Akilia, we may lay our hands on the oldest sedimentary rocks ( about 3.9 milliard years old) that has been found at the surface of the earth. The waters somewhat to the west are a good place to see Humpback Whales and Blue Whales. Day 9 - We find ourselves some way into the Nuuk fjord and land at Nuuk at mid-day. Nuuk (Godthåb - Neu Herrenhut) the capital of Greenland has a rapidly growing population of about 20.000 people. An excursion should include a visit to the museum which has a remarkable collection of Inuit mummies, dating from the 15th Century, which were found near Uummannaq, further to the north. The Cultural Centre of Nuuk, which each year has an exhibition of the work of a Greenlandic artist, is also worth visiting. Day 1 - Nuuk (Godthåb - Neu Herrenhut) the capital of Greenland has a population of about 15,000. An excursion should include a visit to the museum which has a remarkable collection of Inuit mummies, dating from the 15th Century, which were found near Uummannaq, further to the north. The Cultural Centre of Nuuk, which each year has an exhibition of the work of a Greenlandic artist, is also worth visiting. The waters to the west of the town are a good place to see Humpback Whale and Blue Whale. Day 2 - We call at Lichtenfels an abandoned Herrnhuters mission post, with a large cemetery from the 18th century, and Fiskenaes (formerly called Brielse Haven). Day 3 - We sail past Flade Isblink and keep a lookout for Humpback Whale and Minke Whale. Later we sail past Pamiut into Kuanersoq (Kvanefjord) to the island of Qeqertaq at the head of the fjord, and make a landing Ivnarssup qava an accessible and beautiful lake. Day 4 – 5 In Ivittuut we walk along the remains of a Cryolite mine and around a small cemetery connected with it. In this area we see Musk Oxen, which were introduced into the area in the last century. Some way into the fjord we see the beautiful Fox Waterfall, and at the head of the fjord the front of the Arsuk Glacier. We could sail into the Ika Fjord, where from the zodiac we can see the fantastic under water columns of Calcium carbonate hexahydrate. Day 6 – Today we sail to the beautiful glacier fronts of Qaleralik Sermia, where we will have some zodiac excursions and make some landings near the glacier. Deeper into Bredefjord at Qoornooq, we land in an area with remains of houses from the Thule culture. Day 7 – We reach Lichtenau a lovely but nearly deserted Greenlandic village, where the Herrnhuters had a mission in the 18th Century, and where some of their large buildings still remain. We will try to get to Uunartoq, where we can bathe in a large hot spring, surrounded by icebergs. Close to it is Illorpait another abandoned Moravian Mission. Day 8 – At Hvalsey we visit the famous medieval Viking Cathedral, the largest Viking building in Greenland. Day 9 - In Eriksfjord we visit the Viking sites of Gardar (a walk of 3 km from the landing site at Itilleq in the neck of the Peninsula) and Brattahlíð, where Erik Red lived about a thousand years ago. In the evening we arrive at the port of Narsarsuaq. Day 1 - We arrive at Narsarsuaq by chartered plane from Keflavik and board the ship. Day 2 – In Nordre Sermilik (Isafjord) we are surrounded by mountains of over 1000 m. We make a landing on Eqaluit qeqertat and an old Thule settlement, and push as far as the ice-bergs will allow us, to the glacier front of Eqalorutsit Kangidlit Sermiat. Other landings will be possible. Day 3 – Today in Bredefjord at Qoornooq, we land in an area with beautiful remains of houses from the Thule culture. Later we sail to the beautiful glacier fronts of Qaleralik Sermia, where we will have some zodiac excursions and make some landings near the glacier. It is a good area for White-tailed Eagles. Day 4 – We reach Lichtenau a lovely but nearly deserted Greenlandic village, where the Herrnhuters had a mission in the 18th Century, and where some of their large buildings still remain. We will try to get to Uunartoq, where we can bathe in a large hot spring surrounded by icebergs. Across at Vagar we find the remains of a Viking homestead. Day 5 – Herjolfsnes (Ikigait) was the first landfall site for the Vikings when they arrived from Iceland in Greenland. Across is the small settlement of Fredriksdal, where the Moravians had an important mission post. Day 6– AtHvalsey we visit the famous medieval Norse Cathedral, the largest Norse building in Greenland. Day 7 - In Eriksfjord we visit the Viking sites of Gardar (a walk of 3 km from the landing site at Itilleq in the neck of the Peninsula) and Brattahlíð, where Erik Red lived about a thousand years ago. In the evening we arrive at the port of Narsarsuaq. Day 8 - From Narsarsuaq we fly by chartered plane to Keflavik. Day 1 - We arrive at Narsarsuaq by chartered plane from Reykjavik and board the ship. In the evening we visit Bratthalid where Erik Red lived about a thousand years ago. Day 2 – We reach Lichtenau a lovely but nearly deserted Greenlandic village, where the Herrnhuters had a mission in the 18th Century, and where some of their large buildings still remain. We will try to get to Uunartoq, where we can bathe in a large hot spring surrounded by icebergs. Across at Vagar we find the remains of a Viking homestead. Day 3 – The eastward passing of the Prins Christian Sund surrounded by mountains of over 1000 m is one of the highlights of the voyage. We may make a landing at Svaerdfiskens Havn. Day 4 – 8 Sailing northward we land at Timmiarmiut, an abandoned settlement, and sail around Skjoldungen, one of the most spectacular fjords of southeast Greenland. We also land at Umivik, where Nansen ascended the Greenland ice-cap and sail into Køge Bugt and Unartoq, where warm springs await us. Day 09 – Isortoq is an East Greenland outpost, where the people still live a traditional life on an island near the foot of the Greenlandic ice-cap, which descends here to the sea. Day 10 – Tasiilaq (about 2000 inhabitants) is the centre of East Greenland, and has a museum. In this area the Europeans first met the Eskimos of East Greenland at the end of the 19th century. Day 11 – From the island of Kulusuk we take the charter flight to Reykjavik. Day 2 – 6 After sailing parallel to the magnificent coast of East Greenland we reach Umivik, where Nansen began his crossing of the Greenland ice-cap in 1888. We will follow a very short distance in his steps towards and on the Greenland ice-cap. From there we work our way in inshore waters into some fjords back to the north sailing into Køge Bugt a landscape which is similar to Antarctica. We will also sail into Unartoq, where we find warm springs and land at Husryggen, a vegetated area. Isortoq is an East Greenland outpost, where the people still live a traditional life on an island near the foot of the Greenlandic ice-cap, which descends here to the sea. We will see how far we can get into the famous Sermilik Fjord and Johan Petersen Fjord with its steep glaciers. Day 7 -Tasiilaq (about 2000 inhabitants) is the centre of East Greenland, and has a museum. In this area the Europeans first met the Eskimos of East Greenland at the end of the 19th century. Day 8 – From the island of Kulusuk we take the charter flight to Reykjavik. Day 1- We arrive at the airport of Kulusuk by charter plane from Reykjavik. 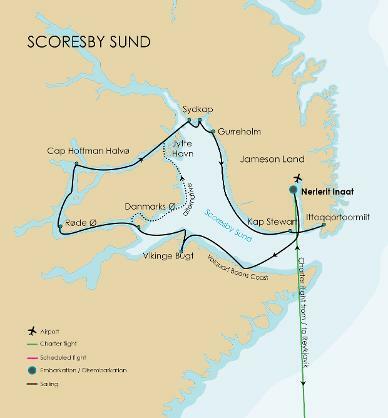 Day 2 – 6 Sailing northward along the East Greenland coast we will enter several fjords, competing in great beauty, Ikerssuaq,, Kangerlussuaq, Miki’s, Nansen and d’Auney’s, most of these with glacier front at the head. Any of these fjords can offer us a chance to see a Polar Bear. Day 7- Rømer Fjord and Turner Sound give us the opportunity to sail far inland as they have no glacier front at the head and they are not clogged with glacier ice. Which give us also good hiking opportunities. From a ridge on the Manby Peninsula we have a stunning view across the landscape. Day 8– Stewart ø is an important hunting station for the people from Scoresby Sund. It is a good area for Narwals . There are also beautiful remains of Thule houses. Day 1 - We arrive by charter plane from Reykjavik at Nerlerit Inaat (Constable Pynt), the airfield at the head of Hurry Inlet. The area has a fantastic geology. Day 2 - We sail along the ragged and glaciated Volquart Boons Coast. Here we may organise a zodiac cruise along one of the glacier fronts of this coast, and have our first landing near a glacier, like Måne Glacier or in Vikingebugt. Day 3 - We land on Danmarks ø where there are remains of an Inuit settlement abandoned around 200 years ago. The circular ‘tent rings’ of stones indicate the summer houses, while the winter houses can be seen closer to a small cape. The sites are well preserved, allowing entrances and even bear-proof meat caches to be identified. There are also grave sites. Day 4 - We continue our sailing through the beautiful fjords to the west, choked with icebergs and try to land on Røde ø, where we see incredible beautiful sandstone formations with basalt intrusions and a back ground of myriads of contrasting blue ice-bergs. Day 5 - We go ashore at Cape Hofmann Halvø, a reliable spot for viewing Musk Oxen. We may also spot Rock Ptarmigan and at sea, the Great Northern Diver. The landscape here is particularly beautiful, especially during autumn when the Dwarf Willow and Dwarf Birch change colour. Arctic Blueberry and Crowberry add their own colourful touch - the berries are tasty too! In the evening we sail through the fjord towards Scoresby Land enjoying the contrast between the warm autumnal colours of the vegetation on shore, backed by huge dark mountains, and the cold blue of the icebergs. Day 6 - On our way to Sydkap in Scoresby Land in the morning, we encounter huge icebergs, some over 100 m high and more than a kilometre in length. Most of the bergs are grounded as the fjord is only about 400 m deep here. We land near Sydkap to view the remains of the Thule culture winter houses. As many as 20 people lived in these tiny houses, hunting Greenland Whale and using their vertebrae to build the houses. Day 7 –In the morning we land on the south coast of Jameson Land near Kap Stewart at a lagoon, an area with waders and geese collecting for the autumn migration. The landscape here is gently undulating. Musk Oxen and Collared Lemming survive on the meagre vegetation. In the afternoon we visit Ittoqqortoormiit, the biggest settlement in the Scoresby Sund with about 400 inhabitants. At the post office you can buy stamps for your postcards, or just wander around to see the sledge dogs and the drying skins of seals, Musk Oxen and Polar Bears. Day 8 - We sail into the Hurry Inlet where at the head of the fjord we land at the airfield of Nerlerit Inaat (Constable Pynt) and fly with chartered plane to Reykjavik. Day 1 - We arrive by charter plane from Reykjavik at Nerlerit Inaat (Constable Pynt) the airfield at the head of Hurry Inlet. The area has a fantastic geology. Day 3 - We land on Danmarks ø where there are the remains of an Inuit settlement abandoned around 200 years ago. The circular ‘tent rings’ of stones indicate the summer houses, while the winter houses can be seen closer to a small cape. The sites are well preserved, allowing entrances and even bear-proof meat caches to be identified. There are also grave sites. Day 4 - On our way to Sydkap in Scoresby Land in the morning, we encounter huge icebergs, some over 100 m high and more than a kilometre in length. Most of the bergs are grounded as the fjord is only about 400 m deep here. We land near Sydkap to view the remains of the Thule culture winter houses. As many as 20 people lived in these tiny houses, hunting Greenland Whale and using their vertebrae to build the houses. Day 5- We visit Ittoqqortoormiit, the biggest settlement in the Scoresby Sund with about 400 inhabitants. At the post office you can buy stamps for your postcards, or just wander around to see the sledge dogs and the drying skins of seals, Musk Oxen and Polar Bears. Day 6– Stewart ø is an important hunting station for the people from Scoresby Sund. It is a good area for Narwals . There are also beautiful remains of Thule houses. Day 7- Turner Sound and Rømer Fjord give us the opportunity to sail far inland as they have no glacier front at the head and they are not clogged with glacier ice. This is an area with best chances to see Polar Bears and Narwals. Day 8 – 9 At sea, with great opportunities to see the Aurora Borealis, while sailing under canvas.